It was from days of Flash 5 which this book first time appeared. Long time has elapsed (expecially considering the informatic times). 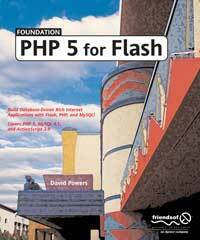 Today I see that friends of Ed has published a new version of this book covering ActionScript 2.0, PHP 5 and MySQL 4.1. Taking a look at the sample PDF chapter available it seems quite well done, clear and simple to read (ok, that is 2nd chapter and it talks of very basic things already…), but i noticed that it also threats of things/problems which often occured if you use php and flash everyday.. for example escape characters, magic_quotes_gpc etc..